BREATH FLOW THRIVE : I'm BAAAAAAACCCCCKKKK!!!!! I found these great little boards at the .99 cent store about a month ago. I bought them in Pink as my room is on track to being Pink/Brown/Beige for right now. They had so many varieties of these boards....chalk, white, cork, and a calendar! I bought 15 and decided to do 3 rows of 5. 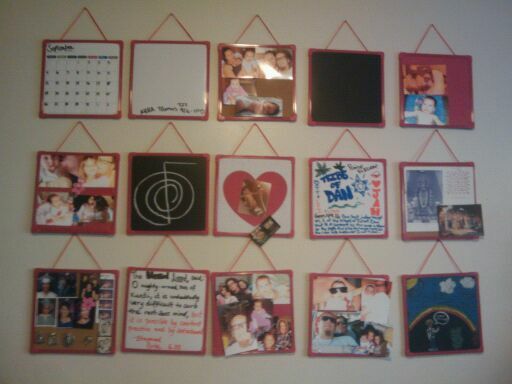 I love this because I can always change it around and rearrange the pictures as often and as I need. As baby grows older I can post newer pics of her. I also like to write inspirational things I can read as soon as I wake up. I used my pastels on the chalk board. The bottom right hand corner was drawn by my sig. other. It's so cute and I loved that it's personalized! Since my last post I have acquired a sewing machine - who knows when this will be used I still need a table for it before I even think about starting this next endeavor. I have a few swaps I'm working on which are way fun! Most of my swaps are for my birthdayyyyyy! I will be 34! in less than 2 weeks!!!! OMFGoodness! Wow. Ok, that's enough for now....I'm off to puree some soups and sauces!